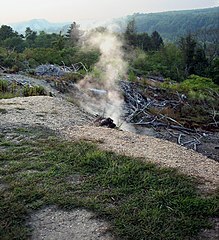 Centralia is a borough and ghost town in the Coal Region of Pennsylvania, atop a mountain ridge north of Ashland and east of Mount Carmel. Centralia was founded as "Bulls Head" in 1811; the 155 acre Centralia Borough was incorporated in 1862. The primary local industry was the extraction of anthracite coal. Many of the original workers were Irish; there was a long history of labour disputes. Ukrainian immigrants soon followed. The borough had nearly 3,000 people at its peak; there were 1,100 people in Centralia in 1962. Centralia is now a ghost town with a population of less than five. An underground coal fire has been burning underneath the town since 1962. The full extent of the danger became known in 1979, and the town was abandoned between 1984 and 1992. In 1992, Pennsylvania claimed eminent domain over the remaining houses in the borough. The main highway has been re-routed away from the fire; most of the structures in the town have been demolished, leaving a damaged wasteland of empty streets. Portions of the 2006 horror film Silent Hill were inspired by the story of Centralia as recounted to screenwriter Roger Avary by his father, a mine engineer; the picture is nominally set in West Virginia. Centralia is two miles north of Ashland, Pennsylvania and can be reached on state highways 54 and 61. Part of the highway between Ashland and Centralia has been rerouted around the site of the fire. You can drive around the highways. Most of the surface streets, however, are in poor condition. Park your car at either end of where the highway has been rerouted around the fire, and walk along the old portion of the road to see spots where smoke is coming out of cracks in the crumbling roadbed. Visit the one remaining church, built in 1911 in a hilltop location on solid rock just outside the borough line. 40.8088-76.34251 Assumption of the Blessed Virgin Mary, North Paxton St. (two blks N of Rte 42), ☎ +1 570 339-0650. Open Sundays and holy days. An ornate Ukrainian Catholic Church with distinctive domes and stained glass; the parish was established Aug. 15, 1911 to serve the immigrant community. Designated as a place of pilgrimage in 2016 by the primate of the worldwide Ukrainian Catholic Church, a local congregation of about fifty people still gathers here from other nearby towns. In the words of Matthew 16:18, "I tell you that you are Peter and on this rock I shall build my church; the gates of Hell shall not prevail against it." Drive around the streets of the old town. Most of the houses have been demolished but a few remain standing. A few people still live in Centralia despite the state having condemned the remaining houses, so remember to respect their privacy and property. There are no longer any stores in Centralia. Barrett's Hot Dogs, Locust Ave. and South St., ☎ +1 570-221-7350. This lone transient street food cart had appeared in the area in 2016, over local objections. No guarantee this or any other food will be available; there is no permanent restaurant still extant in Centralia. There are no longer any bars or coffee shops in Centralia. No hotels are still standing in Centralia; try Ashland or Mount Carmel. Centralia's postcode, 17927, was revoked by the US Postal Service on September 18, 2003; any mail for Centralia is held for pickup in Ashland. Although locals and residents of neighboring towns get together for cleanup days and other local events, there are no newspapers. Centraliapa.org does write news articles about the latest happenings in the town. As a few people still live here, some homes are still occupied. Please leave them undisturbed and refrain from adding to the vandalism and graffiti that less responsible visitors have created – both for the residents’ sake and for the sake of the next visitors to enter Centralia. Note: Centralia is a nightmare of unstable ground and dangerous fumes. This town is condemned, and toxic gas may rise from the ground at any time. When the coal was originally mined, a few pillars of coal were left intact to prevent the ground above from collapsing into the mine. The fire has destroyed these pillars, leaving badly-damaged ground with huge cracks which release smoke, heat and toxic fumes. This makes much of Centralia very unsafe. There were reports of police turning visitors away in early 2017; as of June 2017 the police were gone and the curiosity seekers were still present. Proceed at your own risk. Nearby Ashland offers food, gas, lodging, and a coal mine tour at Pioneer Tunnel. The mine tour includes an underground mine tour, and an above-ground narrow gauge railroad ride to an old bootleg mine at a site where Centralia is visible at a distance. The same vein of anthracite that is burning underneath Centralia extends through Ashland and can be seen as part of the underground portion of the Pioneer Tunnel tour, although the fire at Centralia is not expected to threaten Ashland for several decades. Mount Carmel also offers food, and is larger than Ashland. Looking for an environmental disaster of comparable severity? Picher (Oklahoma), 1,150 mi (1,850 km) and one time zone to the west, is an abandoned town undermined by decades of lead extraction. The surface water is contaminated by mine tailings; a deadly tornado drove the last nail in Picher's coffin in 2008. If Centralia wasn't enough to quench your thirst for underground fire pits, and you are willing to drive five hours in the desert in a country infamous for visa difficulties, Darvaza, the only other place in the world quite like Centralia, awaits. This city travel guide to Centralia is a usable article. It has information on how to get there and on restaurants and hotels. An adventurous person could use this article, but please feel free to improve it by editing the page. This travel guide page was last edited at 00:34, on 25 November 2018 by Wikivoyage user K7L. Based on work by Wikivoyage users Mbrickn, SelfieCity, Traveler100bot, AndreCarrotflower, Eco84, Mx. Granger, Koavf, Smokestack Basilisk and Rastapopulous and others.